Susan Harbage Page received her M.F.A. in photography from the San Francisco Art Institute in 2004, and an M.M. and B.M. in saxophone performance from Michigan State University in 1983 and 1981. She also earned an Italian language certificate from the Italian University for Foreigners, Perugia, Italy, in 1984. She now teaches photography at the University of North Carolina at Chapel Hill. Page’s art works—feminist and anti-racist—reveal layers of meaning in media that include photographs, altered textiles, and video installations. Her work is in numerous public collections including the Baltimore Museum of Art; Birmingham Museum of Art, Alabama; High Museum of Art, Atlanta; Mint Museum of Art, Charlotte; Springfield Museum of Art, Ohio; Museum of Fine Arts, Houston; and the Israel Museum. She is the recipient of many awards including a research grant from the Center for the Study of the American South at the University of North Carolina at Chapel Hill; a project grant from the Emrys Foundation, Greenville, South Carolina in 2005; two North Carolina Arts Council Fellowships in 2004 and 2000; Camargo Foundation Fellowship, Cassis, France in 2002; and a Fulbright travel grant in 1992. Page has exhibited her work nationally and internationally in over 100 exhibitions. In addition, four books of her work have been published: Susan Harbage Page: Postcards from Home, 2007; Involuntary Memories: Photographs by Susan Harbage Page, 2006; Susan Harbage Page: The Tie That Binds, 2003; Standing Still: ATA Center for Contemporary Art—Sofia, 2001. Embroideries continue the link to textiles, which began early in my career when I photographed the women I worked with in a textile mill. I’ve always been interested in women’s’ work and labor and the way that it is often undervalued. Embroidery also represents an uncontested space, a space that women didn’t historically have to fight for. I’ve been collecting old embroideries made by anonymous women for years. They cost a quarter or a dollar. I buy them at second hand stores and put them away. I often ask myself “If a man had made this would it cost more? Would it be better preserved?” “How many hours were put into the construction of this object?” They are things of beauty made with care and skill for women by women. They are also two sided objects; they are proof that someone loved you so much they made this for you while at the same time becoming small burdens. Unused, you carry these small burdens from house to house since throwing them away would make you feel guilty. My grandmother embroidered, my mother taught me to embroider. It is a skill that was passed down to me through the women in my family. 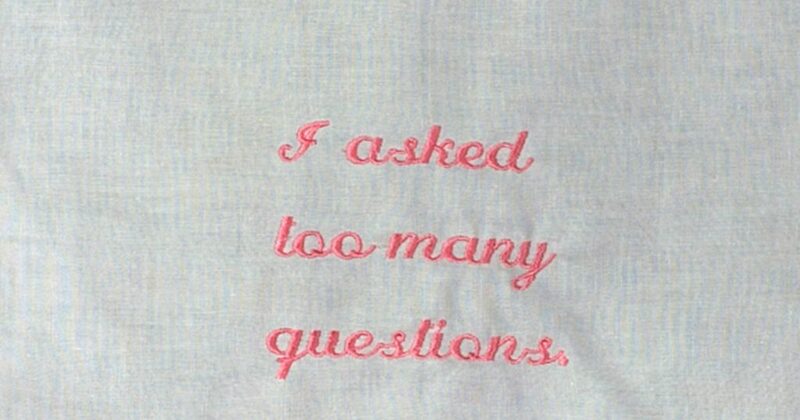 In the summer of 2006, I began to work back into the found embroideries, reclaiming them and asking questions about women’s’ lives and the political world we live in by adding words and images to the already existing stitches.